I have a confession to make..I spend a rather large portion of my paychecks on books. Dave even joked once that he needed to give me store credit instead of a check. I almost agreed, but I restrained myself. Every holiday I pick a favorite book but I have so many to choose from - its difficult! Thankfully, I have amazing co-workers that show me books they think I will love and this is how I discovered my favorite for the Halloween season. (Thanks Krista!!) 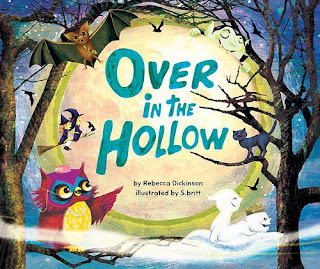 The winner is - drum roll, please - Over In The Hollow by Rebecca Dickinson , illustrated by S.britt. The story takes you through the activities of 13 classic Halloween characters counting up to the grand finale of flying ghosts. Dickinson's descriptive language and refreshing rhyme scheme makes Over in the Hollow a fun read through out. Also, the illustrations? Love at first sight. I'm a sucker for S.britt's style and his images remind me of the 'good 'ole days'. (Charley Harper, ect) My favorite page, hands down, is the page with the owls. I liked it so much I almost decided to be the sleepy owl for Halloween. Bottom line, Over in the Hollow is a must have for your book shelves. But, beware, it's so catchy it may get stuck in your head. I told you the page with the owls was awesome. I might be just a wee bit biased since the author is my sister. But I'm quite sure I'd love it anyway.